Yes, Falcon Heene. Remember him? Well, I will get back to him in but a few moments. To quote the thirty-ninth president of the United States of America, James Earl Carter, Jr., "Trust me." I will get back to Falcon Heene. Indeed, human beings are easily distracted. We tend to be distracted in our prayers as the demons do everything they can to prevent us from praying with fervor and devotion, especially while assisting at Holy Mass or as we are praying Our Lady's Most Holy Rosary. The inability of people to focus on serious prayer, including mental prayer, is attributable, at least in large part, to the "busyness" of the Protestant and Novus Ordo service and its demand for the "full, active and conscious participation" of the faithful in the liturgy, meaning that the spirit of silence and recollection found the Immemorial Mass of Tradition that was conductive to full interior participation in the unbloody re-presentation of Our Blessed Lord and Saviour Jesus Christ's Sacrifice of Himself to His Co-Equal and Co-Eternal Father on the wood of the Holy Cross in atonement for our sins produced Catholics whose prayers at Holy Mass were incomplete, passive and unconscious. Lost in this mythology is the simple fact that illiterate Catholics throughout the centuries had a precise and reverent understanding that Holy Mass is indeed the unbloody re-presentation of Calvary as treated Our Blessed Lord and Saviour Jesus Christ's Real Presence with respect and awe. Can this be said about the effects of the Novus Ordo liturgical service upon many Catholics who are as of yet attached to the structures of the counterfeit church of conciliarism? The Novus Ordo's promulgation by Giovanni Montini/Paul The Sick on April 3, 1969 (it went into effect on Sunday, November 30, 1969, the First Sunday of Advent) came at a time when television was sapping the attention-span of ordinary Americans. The advent and the widespread mass production and sale of remote control television devices made it possible for people to change from channel to channel with abandon, and the variety of channels increased as cable and satellite networks were launched, offering them scores and scores, if not hundreds, of choices that they could make with their fingertips. The Internet has multiplied by a factor of millions the places where one can go to waste his time and lose his soul with clicks of the "mouse" on his computer or whatever "personal device" (I know nothing about those either) repeatedly over the course of the day. The production of early video games in the 1970s, most of which had to be attached to televisions by cables, on which people could play such games as "pong," started the craze of such games, have made more and more succeeding generations of Americans incapable of concentrating for long periods of time on anything, no less of rational discourse on the Faith or current events. Everything must be in the form of the infernal "sound bite," "easy to digest." Efforts to provide sustained treatments of issues are treated by many young people with instant disdain and contempt. The naturalists of the advertising industry on Madison Avenue know this, which is why they have fashioned commercials in a flashy manner so as to "grab" the audience's attention and place a slogan or image in their memory that will prompt them to purchase whatever good or service is being advertised. This, of course, has influenced how naturalists who belong to the two principal organized crime families of naturalism in the United States of America, the Republican Party and the Democratic Party, as they rely almost exclusively upon marketing for tailoring campaign speeches and crafting their campaign strategies. Gone are the days when the naturalists of yore could give stem winders of three or four hours without any notes, thereby providing their audiences, who were starved for some kind of entertainment and had normal spans-of-attention that had not been altered by the television and computer eras, with information, with information, a lot of it bogus, upon which to base their votes. Those days are long gone. Long gone. If you think about it for a little while, ladies and gentlemen, Jorge Mario Bergoglio/Francis, more so than any other false "pontiff" before him, has added to the "noise" that exists in this era of supposed "news" and "information." As has been noted in many articles in the past seven months, thirteen days, it is impossible for one person to keep up with this barrage of constant noise and that this figure of Antichrist has created, no less to deal with all of the scandalous images that have been scattered far and wide displaying the man's penchant for violating the physical of others in the name of "warmth" and "caring" no matter the bounds of decency he violates in the process. Jorge Mario Bergoglio is an undisciplined mass of impulses, each of which is truly revolutionary. 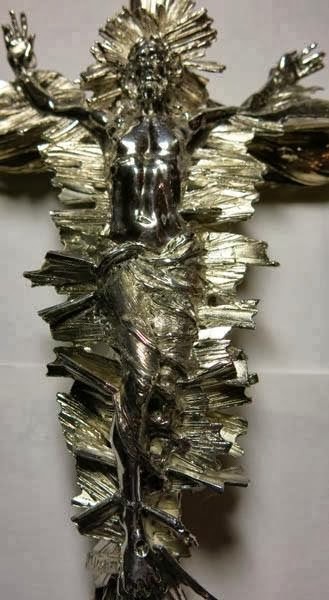 A gigantic hoax has been perpetrated by Modernist revolutionaries posing as officials of the Catholic Church as they have propagated one false doctrine after another and have dared to profane the honor and majesty and glory of the Most Blessed Trinity by means of false, sacrilegious and sacramentally barren liturgical rites and by engaging in one diabolically inspired act of so-called "inter-religious prayer" after another, going so far as to treat the representatives of false religions as having a mission from God to serve Him and to sanctify and save souls. The perpetrators of this carefully-crafted hoax have attempted to give "joint blessings" with the "clergy" of these false religions, thus conveying, no matter their words to the contrary, a spirit of religious indifferentism that have convinced countless hundreds of millions of Catholics and non-Catholics alike around the world to believe that one religion is as good as another, that all that matters is the "service of the poor." This is where Falcon Heene comes back into the picture. Yes, the then six year-old Falcon Heene made some fame on October 15, 2009, when he hid, at the age of nine, at his parents' direction, in his family's garage while his father and mother, Richard and Mayumi Heene, launched a balloon which they told the La rimer County, Colorado, Sheriff's office contained him. The nation's attention was riveted on the images of the balloon as its path of the fifty-mile flight that it took it all around the surrounding area before landing twelve miles northeast of Denver, Colorado, whereupon rescue teams found that Falcon Heene was not inside the balloon's capsule. It was a matter of time before the whole incident was revealed to be a hoax that had been concocted by his parents for a so-called "reality television" program that they wanted to market to some television network for a series. His parents admitted the hoax, resulting in a ninety day prison term for Richard Heene and twenty weekend days in jail for Mayumi Heene. Falcon Heene is now thirteen years old. It was at the tender age of seven three years ago that he formed what is called a "metal band" that goes by the name of "The Heene Boyz." Here's the story in case you are interested: 'Balloon boy' Falcon Heene, 9, now part of metal band. Talk about child abuse! Pray for these poor, poor boys. Gee, when was the last time you heard a conciliar "pope" condemn" "heavy metal" and the demonic noise that it produces that is designed to agitate souls? Well, it is because of Balloon Boy and his "metal band" that this article has been entitled "Francis and His Balloon Boyz." The article was been so named as Jorge Mario Bergoglio is a partisan of "balloon" liturgies, which he has now brought to the Vatican directly from Buenos Aires, Argentina, and Rio di Janiero, Brazil. This is all a hoax that is far worse that Richard and Mayumi Heene's "Balloon Boy" of four years ago as this hoax mocked Christ the King on the day His universal Social Kingship over men and their nations was celebrated in the Catholic Church, which is in the catacombs at this time, around the world. The counterfeit church of conciliarism is such hoax that over three thousand men and women leave the religious life every year. After all, why remain under the evangelical counsels, such as they are in the fake, phony fraud conciliar sect, when one can live in the world and continue to dress and act and go about one's daily basis as he or she did in a religious community? More often than you think? Perversion is rife in the religious houses and convents of communities, once strongly Catholic, now in the control of the conciliar revolutionaries. This is not news. Leaders from the seven Franciscan provinces in the U.S. publicly backed a group of American nuns on Thursday, calling a Vatican crackdown on the women "excessive." The Franciscans who issued this statement last year, of course, are in perfect harmony with the "theology" of the likes of Jorge Mario Bergoglio and Oscar Maradiaga Rodriguez, whose revolutionary outline for the Bergoglio "Petrine Ministry" is being critiqued (see Commissar of Antichrist Speaks, part one and Commissar of Antichrist Speaks, part two; part three will be completed for tomorrow's posting, God willing and Our Lady interceding). Jose Rodriguez Carballo cannot figure out that the cause of the defections of over three thousand men and women from religious communities rife with heresy, apostasy, sacrilege, natural and unnatural sins against Holy Purity, pantheism, environmentalism, Communism, Eastern mysticism, feminism and blasphemy is the result of the very conciliar revolution of which he, Jose Rodriguez Carballo, who was born in 1953, the same year as my only brother (who is two years, eighteen days my junior), has been and continues to be an integral player. "The first Christians "depicted it as an anchor: hope was an anchor, an anchor tied to the banks" of the afterlife. And our life is just walking towards this anchor. The question comes to mind: where we anchored to ourselves, each of us? Are we anchored right there on the shore of that far away ocean or we are anchored to an artificial lagoon that we created, with our rules, our behaviour, our rhythms, our clericalism, our non-ecclesial ecclesiastical attitudes, huh? Are we anchored there? Everything comfortable, all secure, huh? That is not hope. Where is my heart anchored, there in this man-made lagoon, with really impeccable behaviour...,” Francis said. How can one not feel physically ill when reading Bergoglio's words blaspheming Our Lady. No, this is not the first time that Bergoglio has denied the doctrinal effects of Our Lady's Immaculate Conception, which include her Perfect Integrity, in order to project onto her the disorderly orderly inclinations of one who suffers from vestigial after-effects of Original Sin. Bergoglio has done this several times before in the past eight months, demonstrating once again that he is in complete accord with his predecessor, Joseph Ratzinger/Benedict XVI, who did so in his three-volume work of heresy, Jesus of Nazareth, and as he gave his personal approval for the world premiere of the Protestant-produced The Nativity Story to be shown at the Paul The Sick Audience Hall in the Vatican on November 26, 2006, the First Sunday of Advent. Nonetheless, however, Bergoglio's blasphemy against Our Lady is still sickening beyond words, especially as he is trying to say that we must change our "attitudes" about the "past" just as he contends that she did at the Annunciation. The entirety of the passage quoted just above indicates yet again just how obsessed Jorge Mario Bergoglio is in his Lieutenant Philip Gerard-like quest to hunt down and eradicate all remaining vestiges of recognizable Catholicism in the counterfeit church of conciliarism. Bergoglio once again--and I have lost track of how many times as he sometimes does this several times a week, if not two or three times on the same day--attempted to justify his own revolutionary agenda by the use of his disordered, undisciplined, demagogic attacks on those who are "anchored" in o an artificial lagoon that we created, with our rules, our behaviour, our rhythms, our clericalism, our non-ecclesial ecclesiastical attitude" as we keep ourselves in a "comfortable" "man-made lagoon." Catholics must be "open" to where the "spirit" leads them. 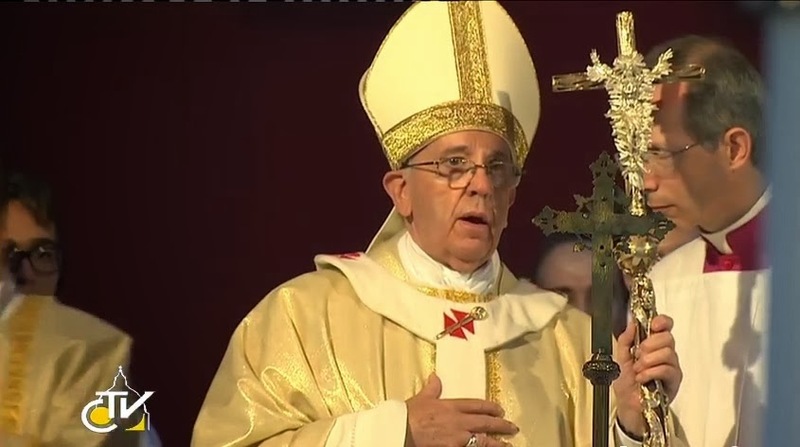 Unfortunately for Bergoglio, though, his "spirit" is not of God, it is of Antichrist. As a demagogue, you see, Jorge Mario Bergoglio uses his visceral attacks as he is incapable of true scholarly discipline. His is a revolution of emotion and the senses, which is why the more disciplined revolutionary agenda outlined by Oscar Andres Rodrigues Maradiaga Rodriguez is far more significant, especially when one considers the fact that Bergoglio has become boringly predictable with his daily screeds, the extent of which is impossible for one person to critique on a daily basis without going insane. Bergoglio, however, is a proud little demon. He is good enough to show us exactly where his "spirit" leads him, providing us with bold displays of his desire for a "new way" to "unite" "believers" and unbelievers. 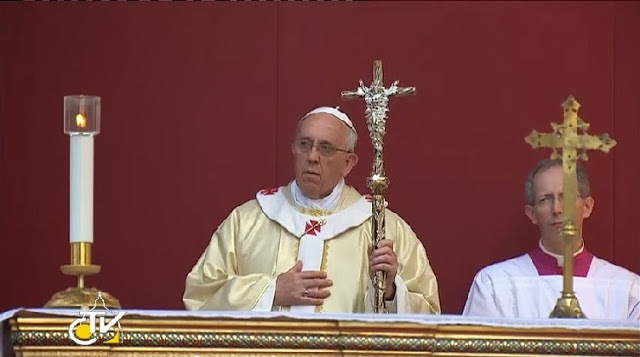 White vestments in alleged Masses for the dead. Fifty-five years of propagandizing in behalf of a false religion in this time of the Great Apostasy that the Order of Friars Minor in conciliar captivity have now issued a prayer card to ask Catholics to ask Saint Francis of Assisi AND "Pope Francis" to "pray for us." There is, of course, plenty wrong with this photograph just as there is plenty wrong, starting with, say, everything, with conciliarism and its false doctrines, sacrilegious liturgy, corrupted moral teachings and truly man-made pastoral practices that are from the devil and can lead to only one place, Hell itself. 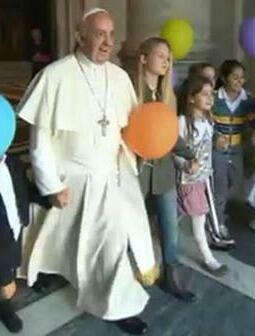 We must have nothing to do with Francis and his Balloon Boyz, and those in the Motu world who think that they can live in their own alternative universe while not bothering too much with the heretics and their balloons ought to reckon with the fact that Bergoglio is coming after each of them in his good time. He will countenance no semblance of "Pelagianism" in his false church. Part of his perverse "mission" to lead everyone in the conciliar sect out of what he thinks is a "man-made" lagoon and into the "joys" of the "Resurrexifix" and white vestments at purported funeral Masses. 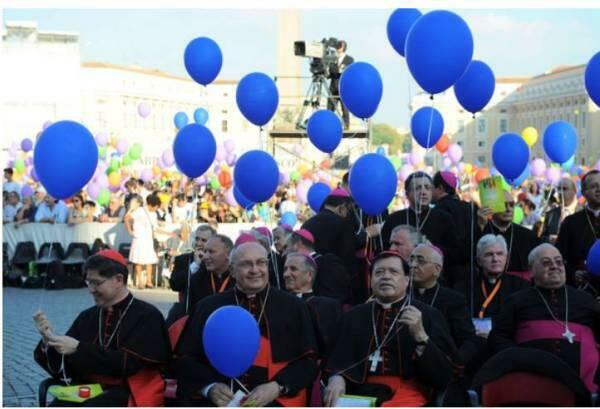 Yes, indeed, their day is coming very soon, which means that they better have their balloons at the ready or come to break with all human respect and recognize, no matter the cost, that none of this can come from the Catholic Church. With prayers to the Poor Souls in this month November, especially as we offer our Rosaries for them as the consecrated slaves of Our Blessed Lord and Saviour Jesus Christ through the Sorrowful and Immaculate Heart of Mary, may the souls who profit from our prayers, penances, mortifications, sacrifices, sufferings, humiliations and good works this month help to provide Holy Mother Church with final relief from her sufferings at this time as we hope that our prayers will bring them such relief by virtue of their speedy entry into Heaven.